A custom crystal chandelier created by Royal Contract Lighting stars in The BFG – the first ever movie collaboration of Steven Spielberg and Walt Disney Studios. 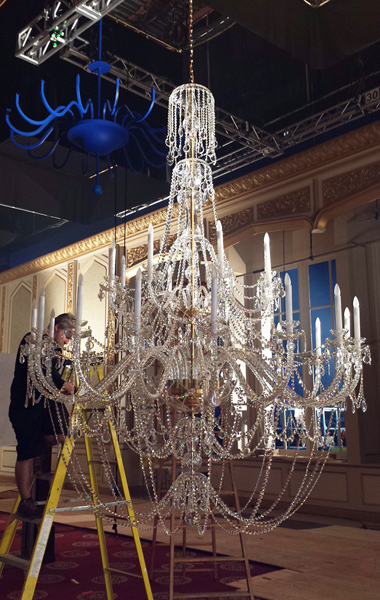 Royal Contract was commissioned by Giant Maple Film Productions to supply the chandelier to the Vancouver production studio. The BFG is the exciting tale of a young London girl and the mysterious Giant who introduces her to the wonders and perils of Giant Country. Based on the beloved novel by Roald Dahl, The BFG (Big Friendly Giant) was published in 1982 and has been enchanting readers of all ages ever since. Dahl’s books, which also include Charlie and the Chocolate Factory, James and the Giant Peach, Matildaand Fantastic Mr. Fox, are currently available in 58 languages and have sold over 200 million copies worldwide. The Spielberg-Disney movie stars three-time Tony Award winner Mark Rylance who plays the titular “Big Friendly Giant”, Ruby Barnhill as Sophie, and joined by Bill Hader, Jemaine Clement, Michael David Adamthwaite, Daniel Bacon, Chris Gibbs, Adam Godley, Jonathan Holmes, Paul Moniz de Sa and Olafur Olaffson, all cast as giants. The movie, which opened in U.S. theaters on July 1, 2016, commemorates the 100th anniversary of Roald Dahl’s birth.